Friends keep asking me about cloth diapers. And they are hard to explain. I was going to take a bunch of pictures because I thought that would be easier than explaining. And then I decided to take a video because that is easier than editing many pictures. It would be even easier if you would just come over and I could show you, but for now, this video will have to work. Do you think less of me than you used to? I hope not. Please love me. Why we use cloth diapers. I decided to use cloth diapers for several reasons. 1) I thought they were cool. 2) They are cheaper. 3) They are better for the environment. 4) They are better for Finley's skin. 5) Sometimes I like to do crazy things just to see if I can do it (run a marathon, drink a gallon of milk, teach in an inner-city middle school). There is TONS of stuff you can read on exactly how much cheaper and better for the earth cloth diapers are and I'm not going to spout all that off. The bottom line is that it isn't best for everyone, but it is best for us. The Diapers We Use. We use BumGenius diapers. There are LOTS of different brands and styles, but this is what I have settled on. We have mostly All-in-One diapers--they fit babies from 7-35 lbs. They consist of two pieces, a microfiber insert and the pocket diaper part. Both pieces go in the diaper pail. They go on exactly like a regular paper diaper. 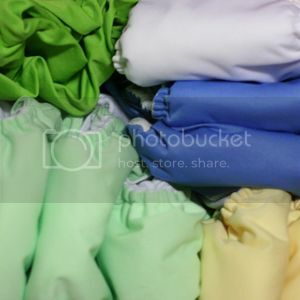 I have a few Flip diapers, which is BumGenius' more economical line. They are also two pieces, but you reuse the outer lining a few times and just dump the insert in your diaper pail. And I have a few fancy Organic ones--they are like the All-in-One diapers but they are one piece so you don't have to pull out the insert after it is used. They are pricey. Cloth Wipes. I wasn't planning on using cloth wipes until I realized what a pain it would be to find somewhere to put used wipes. What has been easiest is keeping BumGenius cloth wipes rolled up in a diaper wipes warmer. They are in a solution that keeps them fresh and wet. I've tried couple different solutions--this one is some little soap things (purchased on etsy) that dissolve in water. I keep the solution in a gallon jug that I pour in whenever they start to dry out. Washing the diapers. This part is not quite as fun... all that scrubbing of the poop and sticking your arms into turdy water. JUST KIDDING! The washer does 99% of the work. When the diaper pail is full, I dump them into our washer and run it once on the delicate cycle. This washes away most of the yucky stuff. (Now that Finley has solid poop, I flip that into the toilet and flush it before I put the diaper in the pail.) Then I run it on a normal cycle, then a hot cycle with an extra rinse with half the amount of soap. 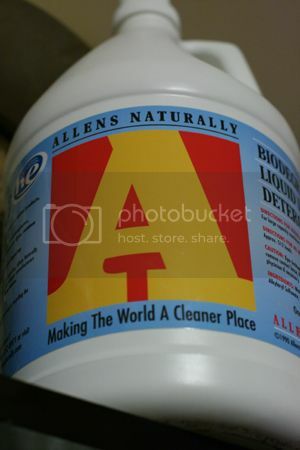 We use Allen's Naturally laundry detergent and it works well. The diapers should come out nice and clean. 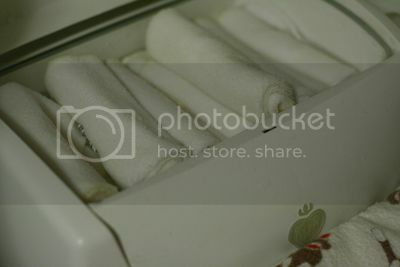 I toss them in the dryer or lay them out in the sun if they are a little stained. After they are dry, I stuff the inserts back in the diapers and we are ready to go! Our washer and dryer is in Finley's room so it's extremely convenient for me. If I had to go up and down stairs to wash them, I very well may not have decided to do them. The other part that makes it SUPER easy is that we don't have Finley in a day care where they won't use the diapers. Amy helps (more than her fair share) at washing and stuffing the diapers when she is here watching Finley because Calvin is wearing them too. The cloth diapers have never grossed me out more than a regular diaper. One thing that is good/bad about them is they do a GREAT job of holding in the stink. Sometimes Finley sits a little too long in some poop because we never smell it. But those explosive poops that newborns have? NEVER happens in a cloth diaper. I have lots of other things I keep thinking of but this is getting kind of long. If you have any questions, I'd be happy to answer them. I'm not even close to being an expert, but I know a little bit. Also, you can't use dryer sheets or diaper cream. Ok that's all. I wish I had kids so I could put all your useful information to use! 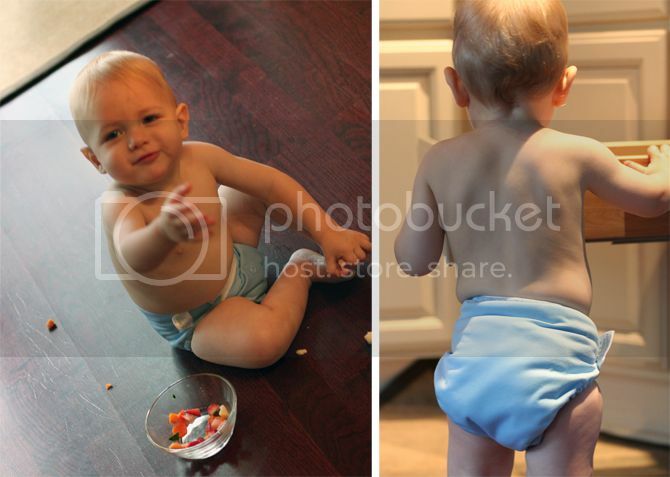 We use BumGenius too...and they are in great condition after using them with Caleb for a year (we started when he was 6 months with them and stopped at 18 months because we were having too many leaks). They are in great shape and will probably still be good IF we choose to have a third baby (in many, many years). I had never even thought about using cloth wipes...I might have to consider that! We use Charlie's Soap and it too washes the diapers well. We still use disposables frequently when we leave the house because it is just easier with 2 kids now. Thanks for your post, Rachel! We need more video like the first 15 seconds. I have to agree with dad. I watched the first 15 seconds about 10 times. So cute!!! How did that whole drinking a gallon of milk thing go for you? Carrie-- I think you know how it went. I am pretty sure we couldn't even drink a gallon together. It went up from where it came. i mean, their little bottoms look a lot cuter in those than the regular diapers. hmmm, as a hippy, i should be motivated to do this. I also think there should be more videos of Finley. I agree with your dad. And I even get to see him every day.